Ascendo DataVault stores confidential information related to credit cards, bank accounts, logins and more using Advanced Encryption Standard, the most powerful technology to secure private data. 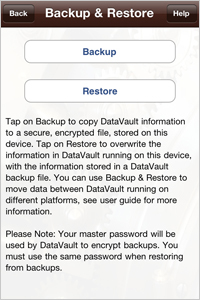 DataVault is the first password manager to support iCloud backup and iCloud synchronization. Securing private information is important and providing the best options to back it up and use it across several devices is essential. 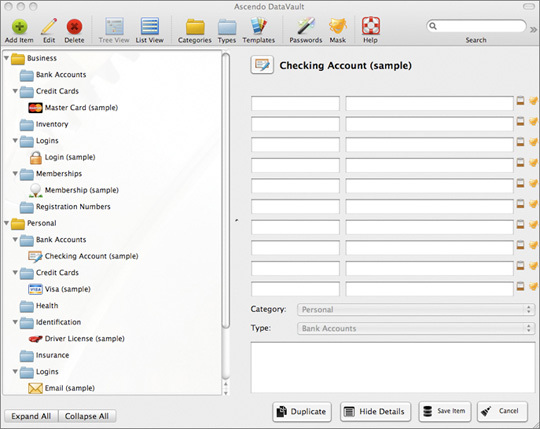 In addition, DataVault includes a host of cutting edge features such as multiple views of items, categories and types, templates, actionable fields, password generator, desktop versions for Mac and Windows (sold separately), alternative sync methods including Wi-Fi & Dropbox and numerous security settings. One copy of DataVault can be run on five iOS devices combining great value with advanced security. 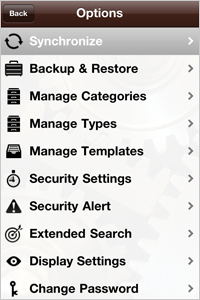 Unrivaled features and ease-of-use have made DataVault a best-selling password manager for iPhone, iPad & iPod Touch. Protects your private information to give you peace of mind. Delivers value by insuring secure access to confidential data everywhere you go. 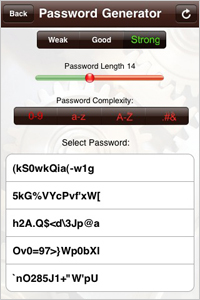 Adapts to your needs by providing more tools and settings than any other password wallet. "This is a terrific organizer for storing all of your usernames, passwords, bank accounts, login information and other personal data. I tried similar apps and none could compare... DataVault is clean, simple and intuitive. I use it constantly. The synchronization with the desktop app is flawless. I highly recommend this fabulous app.."
Display items in folders similar to Mac Finder & Windows Explorer or in list with scrollable index. No other password safe offers both. Numerous enhancements for iPad users including split view to take advantage of larger screen. Backup & restore using iOS4 file sharing. Make multiple, dated copies without installing desktop utility as required by other password keepers. Use iOS4 multitasking and cut & paste to login into web sites. Enable security alert to send email with device GPS location if failed login attempt occurs. Synchronizes with DataVault for Mac or DataVault for Windows (sold separately). 2-way sync with simple options to resolve conflicts. Sync via Mobile Me, Webdav, Wi-Fi, direct connect or file sharing. Find information quickly. Typing search string reduces list to matching entries. Customize search to include field labels, field contents, notes and case sensitivity. Generate Passwords using options for length, letters, numbers, uppercase, lowercase and punctuation marks. Determine password security level; weak, good, strong with strength meter. 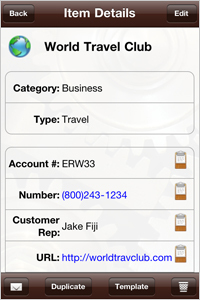 Tap on live links to initiate phone calls, emails & web site logins. Choose from 25 pre-defined templates or make your own. Customize screen colors and backgrounds by selecting from 100 icons, 6 Themes and 2 folder types. Protect your data using Advanced Encryption Standard (AES). To see why Ascendo chose AES over other encryption methods such as Blowfish, Twofish, RC4 or Serpent, click here. Set a Security Time Out to lock DataVault automatically after a user-defined inactivity delay. Choose whether to automatically lock DataVault when quitting before inactivity delay has expired. Setup a master password hint. Mask master password or item fields for additional security. Duplicate Items to speed data entry. Email items in secure format. Support for international character sets (unicode) when synchronizing. 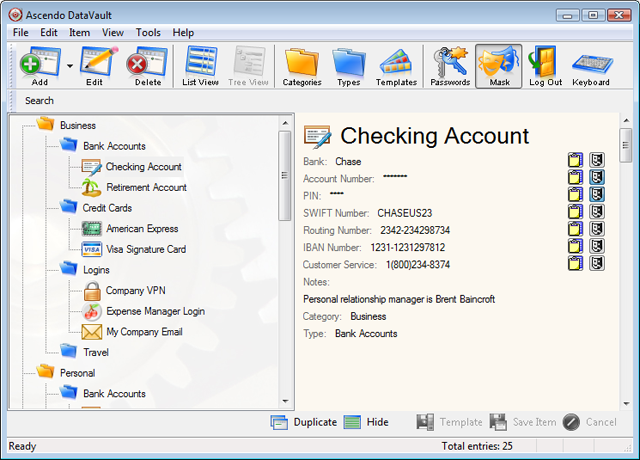 Import data from EWallet, SplashID, mSecure, 1Password, IE, Firefox, Roboform & others using DataVault Desktop. "The app is awesome! Well worth the $10 I paid. I was looking for a secure app I could use to put ALL my sensitive data in, not just logins and passwords. I looked at several other apps like this and found them lacking in one way or another... Extremely easy to use and it is a complete solution for my needs." Sold separately, click here for more information. Synchronize with DataVault for iPhone, iPad, iPod Touch and BlackBerry via Wi-Fi, Mobile Me and other Webdav servers such as Box.net, Swissdisk and Mydrive. Display Items in Tree view organized by Category and Type. Expand and collapse tree levels individually or simultaneously, see image. Display items in View mode to maximize the number of fields per screen or Edit mode to maximize the space available for each field. Tap or click on URLs to launch web sites. Create an unlimited number of Templates with default field labels and item icon or choose from 25 pre-defined Templates. Resolve conflicts in case your entries don’t match (two-way synchronization). Advanced Browser Integration with Firefox, Internet Explorer and Chrome. Fill web forms automatically. For example, click on Gmail item in DataVault to open browser, go to Gmail login, auto-fill username & password and submit form. Use DataVault Toolbar in browser save forms to DataVault and generate passwords. Create desktop shortcuts for web form logins. Drag & drop items or Types to different locations in the Tree. Set options for displaying Tree in Expanded, Collapsed or Last Position by default. Display items in List view. Find items quickly by reducing list after each keystroke. Filter items by Category and Type. Hide item details panel to maximize the number of fields displayed in List View. One-click editing in List View. Duplicate item and use Templates to speed data entry. Mask individual fields or copy to Windows clipboard. Mask/Unmask all fields with one click. Import data from CSV files and from several 3rd party products like Lockbox, KeePass, mSecure, SplashID, EWallet, 1Password, FlexWallet, Handy Safe, Palm Secret, IE, Firefox, Roboform, Cryptmagic, MiniSafe and several others. Share information securely with other DataVault users by exporting & importing items in DataVault Exchange Format. Backup & Restore, export to a CSV file. Compatible with Windows 7, Vista, XP and other Windows versions. 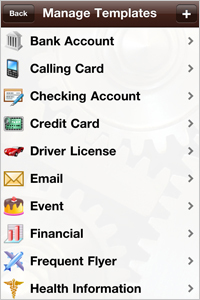 "The application is easy to use, very user friendly and has the best organization out there of any of the iPhone apps I have used for password management. The tree list view and the display of the details for each item make it easy to see user names, passwords, etc. Ascendo has the best customer service of anyone..."
Incorporated in San Diego, California, Ascendo has been a leading mobile developer since 2002. Hundreds of thousands of users have entrusted their confidential information to Ascendo DataVault. 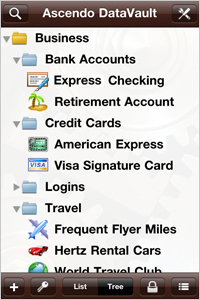 Top Ten iPhone Password Managers "5-Stars"
Bureau of Industry and Security CCAS approval. Why is this important? DataVault for Windows desktop is currently on sale for $9.95 (list price $19.95). DataVault for Mac OS desktop is currently on sale for $9.95 (list price $19.95). 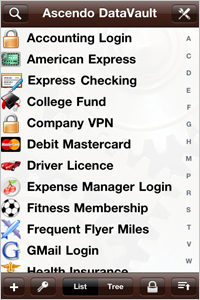 Did you purchase another password manager for iPad, iPhone or iPod Touch and find that you are not satisfied? Ascendo offers Competitive Upgrades to make the switch. For more information please email info@ascendo-inc.com including the name of the product you are considering switching from. Download codes are available for reviewers (certain restrictions apply). 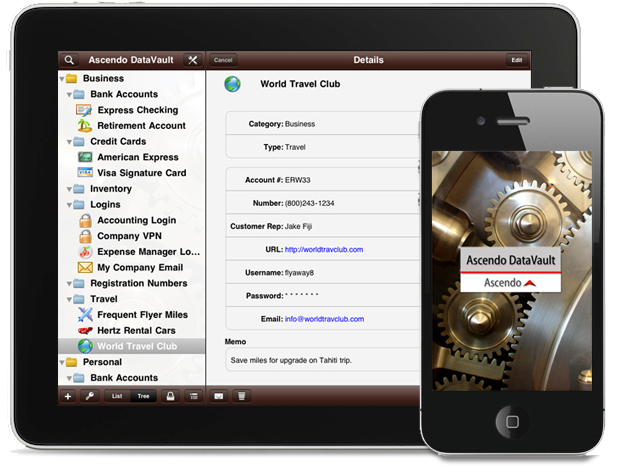 If you are interested in writing a review of DataVault for iPhone, iPad & iPod Touch, please email info@ascendo-inc.com and let us know where you plan to publish your review. Translate this page into Spanish, French, German or Italian and receive a free copy of Ascendo DataVault for iPad, iPhone & iPod Touch. You must be a native speaker of the secondary language to be eligible. If interested, please email info@ascendo-inc.com before submitting your translation.